Most of us are hesitant to play with colors because we might just waste paint and other accents if the colors will not work well. You can always consult the experts in designing to see if your colors will look good together. It also helps to create a color palette for the interior to check how it will turn out. But one best way to know if the colors look good together is to take a look at existing interiors that use those colors. 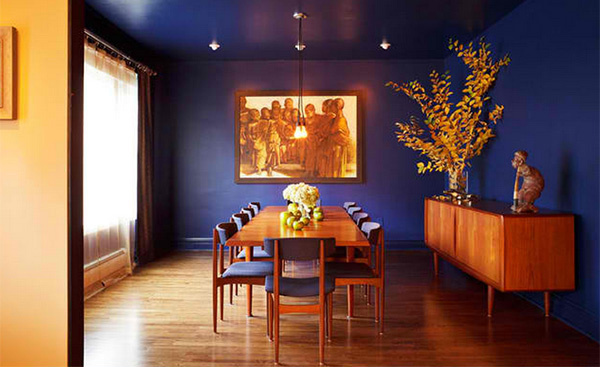 If you are aiming to get a blue and orange dining room, then this list is definitely for you! You can add these colors to the wall or maybe just an area rug that has these colors. You can even add some decors that are either blue or orange. Well, to make it easier for you, check out the dining room interiors below. For sure, you will be able to get ideas from what you are about to see! Image: Jennifer Lang Designs, Inc. 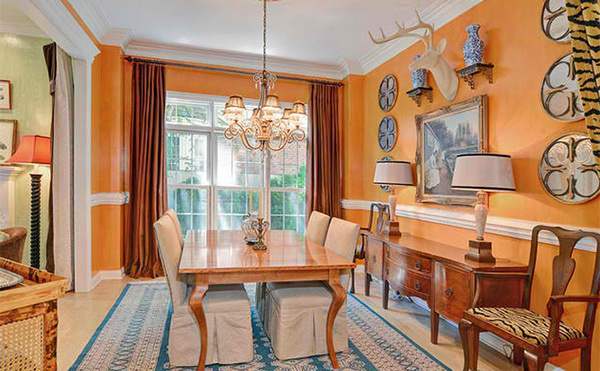 The rug in this dining area is very gorgeous! 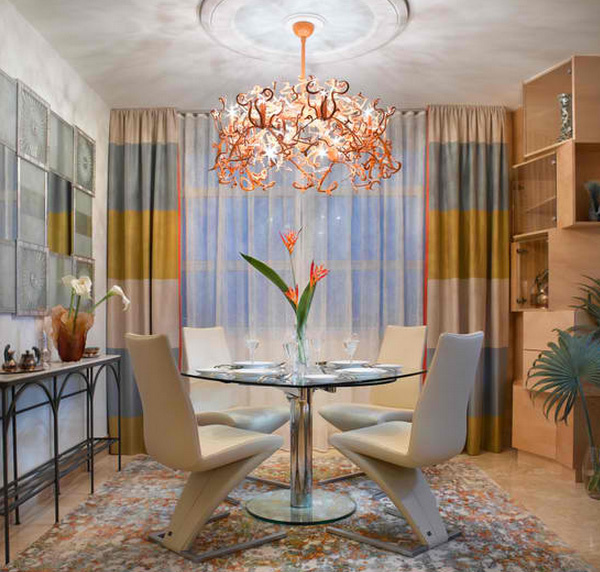 You will never miss the pops of blue and orange from it and of course the orange dramatic pendant light above the dining table. 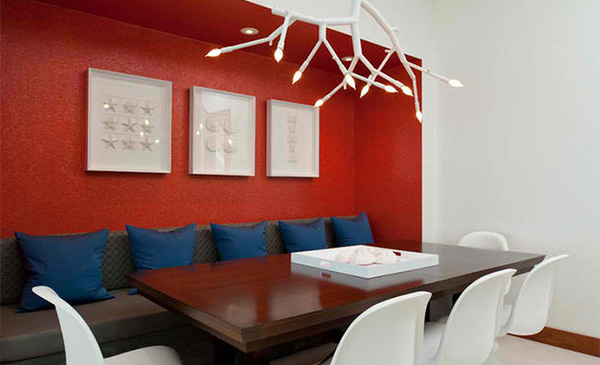 The Paradise Ceiling Light Ango brought some charm into this dining room. The Vintage Thayer Coggin blue chairs and the wall painting matches well together in blue and orange! 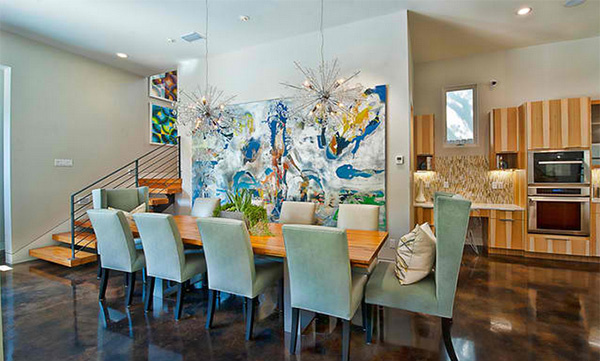 Adding a big wall art could give a dining room the colors you want to add in it. 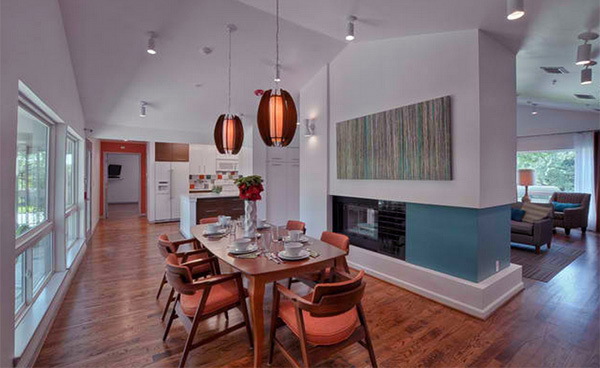 For this space, the blue chairs and the wooden table in orange-y finish created a stunning appeal. Guess you have seen this dining area pretty much but it deserves such feature because this is one catching royal blue dining room with an orange wall art decor. A highly polished marble table, blue chairs and orange accent seating- this is one lovely eclectic traditional dining area! Orange chairs and that Stratford Blue paint on the fireplace worked well together for this mid-century space. 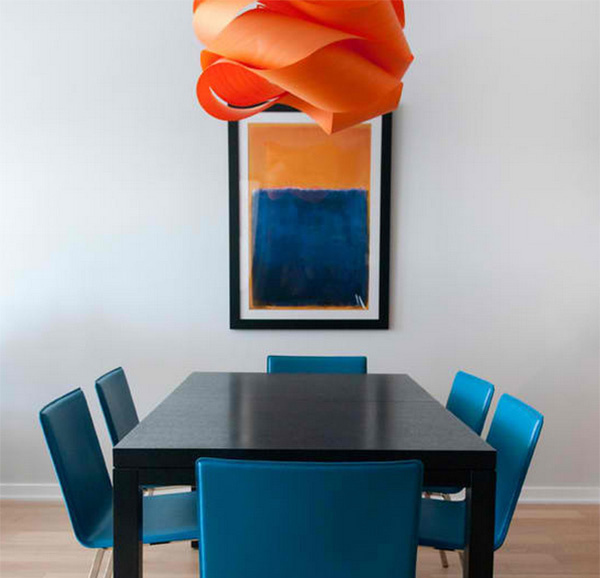 This modern dining room in a condominium sure got that good taste for its color combo in orange and blue! 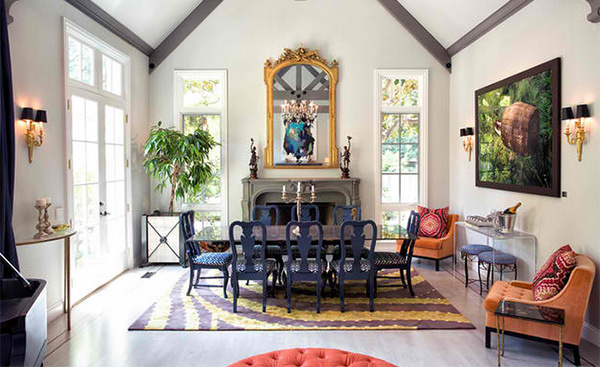 A fabulous dining room with a traditional and contemporary design mix up. You can see how the orange carpet and orange ceiling decor are hindered to meet together with the blue walls and fabrics in it. The chairs of this dining area is simple and even the space is neat and just peaceful but the addition of that wall art and the ceiling light made all the difference. 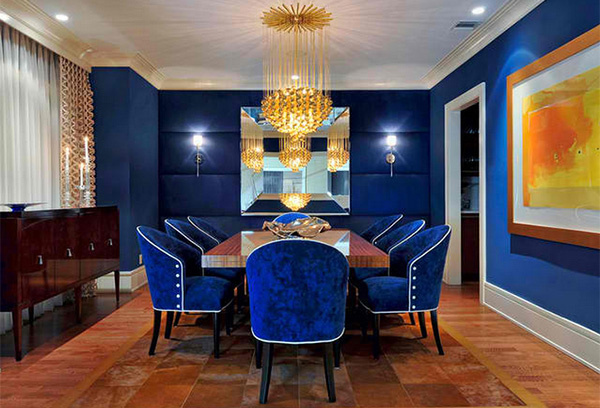 The color from the dining set, wall art and buffet table matches well with the blue walls and dining chairs. This is one dashing modern spot to dine in! 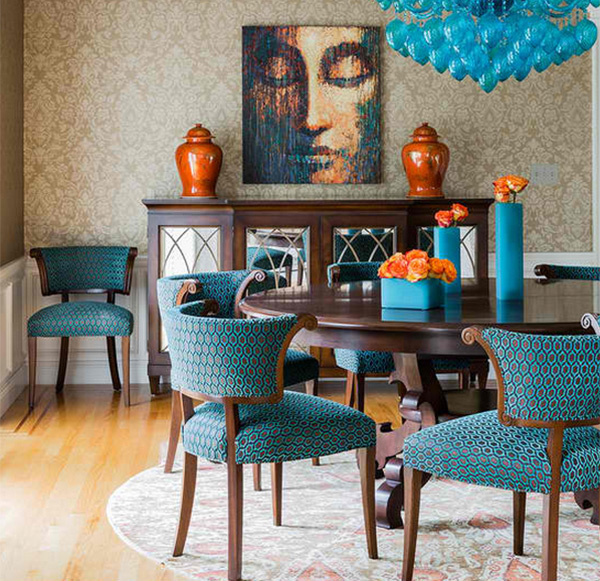 Modern color are used in this traditional dining room. The lighting is so stylish as well as the striped chairs. Orange walls and blue area rug lends in a lively feel to every diner. The wall decors are not just unique but are total head turners! 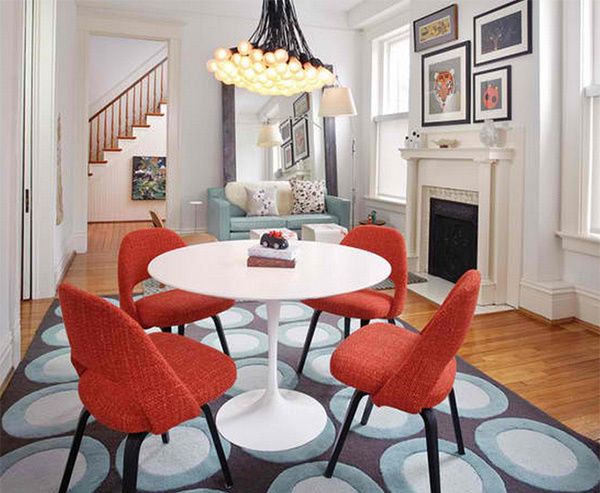 We love how this dining room is decorated while retaining its modern look by using circular designed area rug in blue and modern orange dining chairs. We love this space so much! 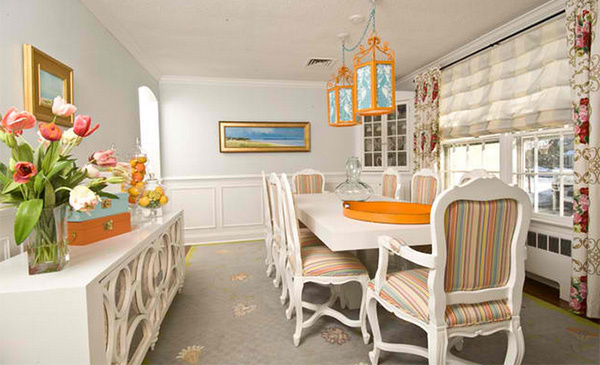 The patterns on the chairs, the chandeliers and the orange accents are so nice! A simple contemporary dining area like this one could be your preference but it doesn’t mean that you could limit the colors. Just look at the red orange wall and blue pillows that looked nice in it! You see, there is no harm if you experiment with colors in your home’s interior. 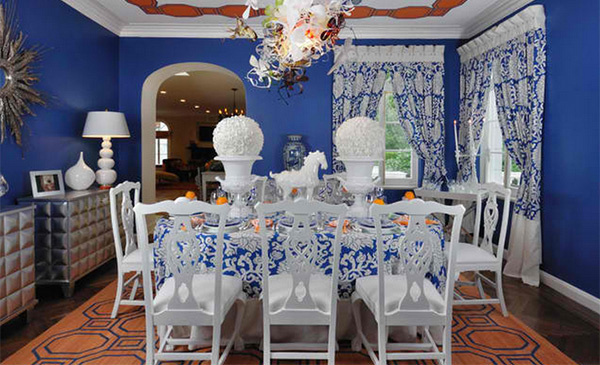 The blue and orange dining rooms above are true charmers and the color combination works well in whatever style you have from modern to traditional. So, what is your fave color combo for the interior? Black and white is the safest and most common combo but you can try other colors too like brown and red or even green and pink!